Compatibility: Requires iOS 10.14.4 or later. macOS Server makes it easy to configure and monitor Mac, iPhone, iPad, and Apple TV devices and network storage volumes. Here’s what you’ll get with macOS Server: Profile Manager •	Mobile device management for iOS, macOS, and tvOS devices •	Distribution of institution licensed apps and books purchased from the Volume Purchase Program to users or devices •	Install Software Updates on devices running iOS 12 and mac OS 10.14 •	Device Enrollment Program integration •	Web-based administration console •	Self-service user portal for clearing passcodes, remote lock, and remote wipe Xsan •	Block-level SAN file sharing with concurrent read/write access •	Xsan volume hosting and configuration •	Volume management, storage pooling, striping, and volume mapping •	Real-time monitoring, graphs, and event notifications •	Metadata controller failover and file system journaling Server App •	Local and remote management •	Users and group settings •	View real-time graphs of server usage •	Receive alerts on network changes, certificate expiration, storage usage, and more Some features require an Apple ID and/or compatible Internet access; additional fees and terms apply. Some features require program enrollment. Some features are not available in all countries. Formerly used this for my small business. Now completely useless. Why is Apple wasting my time by offering an "update"?? So Apple has $200 Billion dollars in cash but they can't spend $1.95 to maintain a fair, not great, admin tool for their small business customers?? At least we know where we stand with management. My Steelcase file cabinet from 1984 shares files better than this "server" software. Apple has completely damaged the server app. This a worthless piece of mailware that has forced me to hack my operating system just to keep it running. So, I clearly understood that many of the services in Server were going away. In fact, I planned for it. What I didn't plan for was the open directory service migration apparently failing along the way and being left with NO open directory. Apparently, I need to figure out how to restore my open directory data or perform all the configuration of it again. Poor form Apple! Don't waste a moment of your time upgrading to this version, and ABSOLUTELY do not buy this product. When my company was small, I couldn't afford the $$$ for MS Server and MS Exchange, not to mention the $ you had to spend on a dedicated IT person just to implement and maintain them. OS X Server was Godsend and allowed us to have the services we desperately needed to grow our business. Email, messaging, web server, file sharing, VPN, etc. OS X Server evolved into MacOS Server and although it wasn't bulletproof, still chugged along as my business grew. Dedicated Apple server software on dedicated Apple server hardware - even Apple branded file servers. Heaven for Mac fanboys! 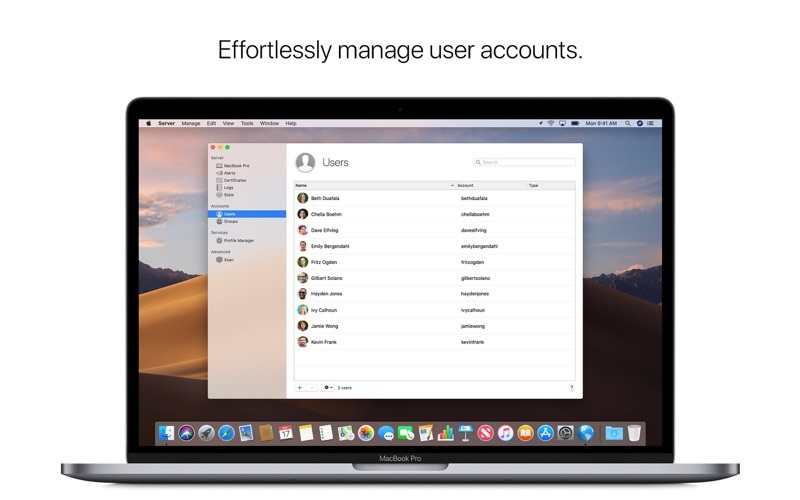 Slowly, but surely, Apple began to gut MacOS Server and now it is nothing but a worthless device manager. Apple has turned its back on the business and enterprise markets and has become nothing but and iPhone and iPad company. The last of my xServes and xRaids were shut down and taken out of my server room this weekend. And with that my blind support of Apple has ended. We have become a Microsoft shop, not because we wanted to, but we were forced to. If I could have given this no stars at all, I would have. Take the word Pro out of your hardware lineup, Apple. You're everything but. Mac Server was reasonably useful and looked very promising at first. But Apple fell asleep at the wheel and failed to turn it into the killer app it could have become with a serious effort to develop it into an easy to use tool for novice systemn administrators and for those in small businesses and families that don't have much money or time to efficiently manage a growinbg stable of Apple devices. At least they could have provided some kind of migration tool to make it quicker and easier to migrate to open source/third party server alternatives. That's the Second Strike from Apple to those customers who had tens of thousands of images and invested hundreds of hours of organizing them in Aperture, before getting abandoned by Apple with no practical way to move forward! Server.app cannot be used on the same server as another web server, including native macOS apache. Previous versions of Server.app included a Web server that worked with the Profile Manager service to avoid the inevitable conflict over ports 80 (http) and 443 (https). But Apple eliminated Server.app's web server, and did not provide any way to have Server.app work with other web servers. It's completely broken: Turn on the native macOS webserver with "apachectl start", and this breaks Profile Manager because apache is already using port 80. Turn on Profile Manager, and this breaks native apache because PM is already using port 80. Botoom line: You cannot install "Server.app" and use your server as a web server. The design of Server.app 5.8 is fundamentally and predictably broken. Apple has never treated macOS Server as a real, well-supported product. They've stripped it of functionality until, now, it really only manages Apple devices. Gone are the web and email servers and all the other functions I used -- and with little warning or notice. Buy this at your own peril. Your next update may remove the reason you bought it. Will just be an icon that plays Never Gonna Give You Up.